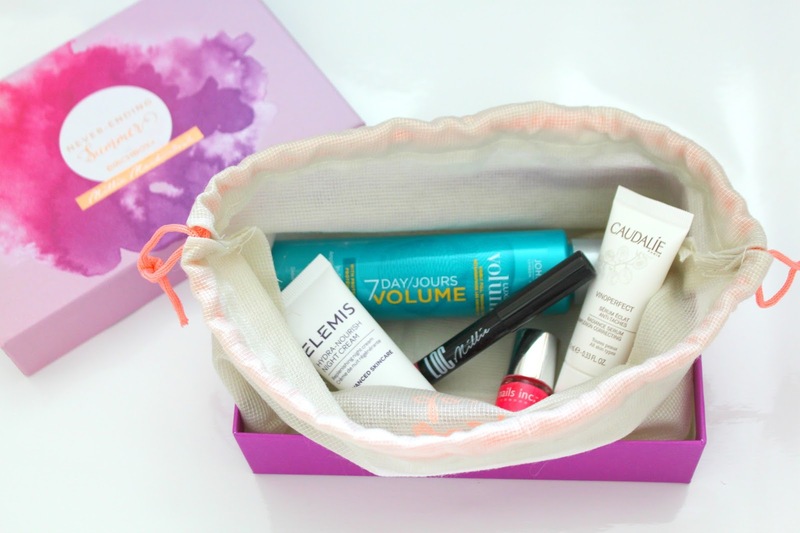 So my lovelies... this is my last Birchbox post (for now)! If you've been following me throughout my Birchbox journey, you would know that my 6th month subscription has finally come to an end. 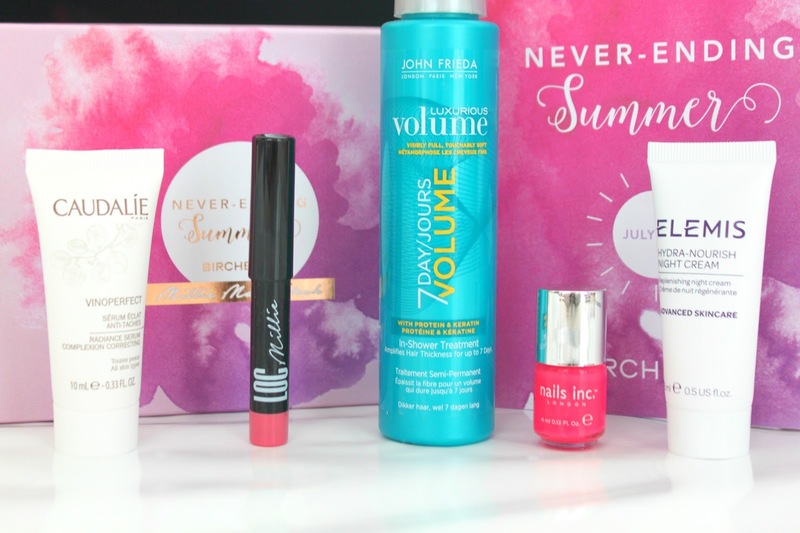 This month, July's 'Never-Ending Summer' box is a collaboration with Made in Chelsea's reality star Millie Mackintosh. Coming in my favourite colour magenta with a bold watercolour print, the box was apparently designed by Millie herself. Promised to not only receive one but two full sized products this month, I was pretty surprised with what I received. We had the chance to choose which full sized product to receive this month and I chose this product opposed to the Anti-Frizz Primer because I don't have frizzy hair. Due to my East Asian genes of having pin straight hair, it can lack volume so I am hoping that this product can add 'oopmh' to my hair. I love how this product is lazy-girl approved by being an in-shower treatment. Apparently the volume lasts through to your next wash too! Hmm... too good to be true? I definitely need to test it out. This lip pencil is my favourite product from this month's Birchbox. Designed and named by Millie, Birchbox's own brand LOC collaborated with the star to create this really pretty matte rose pink shade. I love the colour and its hydrating abilities! The durability of this product isn't too great though, which is a bit of a shame. I actually don't own any nail varnishes from Nails Inc, so receiving this little bitty cutie bottle made me pretty happy. The shade that I received is a really bright neon pink, which I don't currently own. Great colour for the Summer though! Described as "your favourite Instagram filter in a bottle", this serum is said to help even skin tone and fade away dark spots. Free from parabens and sulphates, I'll definitely try this out when my Kiehl's Clearly Corrective Dark Spot Solution runs out. It sounds like it can do the same job! I love receiving moisturisers/creams in my Birchboxes because I love being able to take them with me on my travels and sampling them out. This night cream from Elemis sounds like a dream though! It contains hyaluronic acid (ultra moisture ingredient) to rehydrate complexion and Persian silk tree extract to help reduce signs of fatigue - definitely need to slather this on my face every Monday morning then! I have thoroughly enjoyed and loved my 6 month Birchbox subscription. 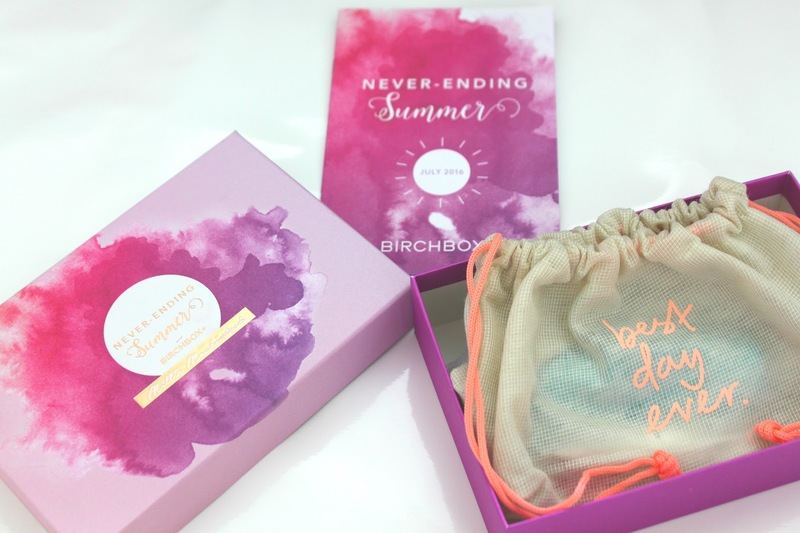 Birchbox was the first beauty box that I've ever received and I was not disappointed with my experience at all. The reason why I have ended this subscription was because it was the end of my Groupon offer, which you can read more about in my first Birchbox review here. I really liked the items that I've received, especially all the full sized products that came in each box (obvs). However, as much as I liked receiving products to try out each month, my vanity table is starting to overfill with all these samples. This isn't a goodbye to Birchbox, its a bittersweet see you later! After testing out the samples I've received throughout the six months, I'll most probably become a subscriber again because on top of being able to test out amazing products, I love the feeling of receiving my beauty box each month as it feels like I've been gifted a present (from myself haha). Until next time Birchbox! I love the packaging! So fun.